Here is an honor-shame paraphrase of Esther, chapter 1. 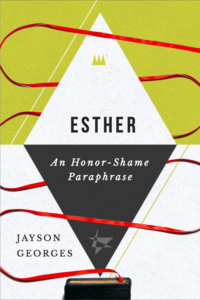 This is excerpted from the new book Esther: An Honor-Shame Paraphrase, available as Kindle or PDF for $2.99. From an ethical point of view is that what brings honour not automatically good in moral terms, and that what brings shame is not just ethical wrong. Many Bible readers denounce the refusal of Vasthi as wrong in moral terms. There is a huge question here, I think. I wonder, in order to better communicate to the modern English audience, if the word ‘display’ in verse 11 would be better rendered as ‘expose’? Just a suggestion. To be put on display is, to my ears, socially awkward, but to be exposed, that’s dishonoring, even a bit humiliating. Thus her reaction. I’ll also offer that my understanding is that the king was asking her to parade in front of the crowd wearing little more than her crown. That “reading between the lines” (possibly wrongly) informs my suggestion for ‘expose’.